Before starting to describe what I did, I would like to tell the short story behind my idea to do it. I was always interested in modern electric vehicles and this includes electric bicycles. When the first commercially available e-bikes hit the market the prices were reaching the sky. Being a university student buying such bicycle was completely out of a consideration. A few years later the first easy to install conversion kits appeared. The prices were again quite high even though I was already employed. A decent kit was more than my gross salary (the country was Bulgaria). Soon cheap Chinese conversion kits and motors showed up. Those had a price I could pay. Unfortunately they didn’t include a battery or it was lead battery. These batteries are very heavy, don’t have much options for different casing style and last but not least they need proper charging or they will degrade very fast. At that point I just gave up and decided I won’t have an electric bicycle anytime soon. I was cycling every day to work (at least in the summer as the road is very dangerous in the winter). This was roughly 20km each day. Pretty good exercise. 🙂 At the beginning of 2015 I changed my job and moved all the way to Norway. As you might know this is the country with one of the highest life standards in the world. This also means I could now afford buying an electric bicycle. But where is the fun in that? I like using my hands to make things so I decided to buy a conversion kit, get the bike I want and get it cheaper than buying a factory made one. The other reason I wanted to have my bicycle converted is the fact I am living almost on the top of a hill which is around 100m above the city center and 65m above the nearest supermarket. Going down is easy of course but getting back up is quite a challenge, especially when I have to bring something heavy like food for the next week. 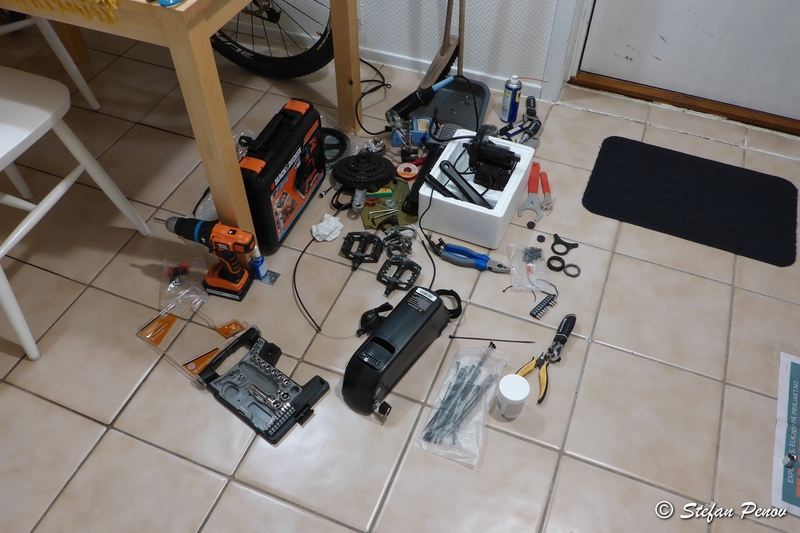 That was the short story of my electric bicycle conversion. I hope you didn’t get bored and left my website already. If you are still reading, thank you! Now starts the interesting part. The first task ahead of me was to select the type of kit I will use. There were three options: front hub motor, mid drive motor and rear hub motor. Why did I choose mid drive? I wanted it to be as flexible as possible. Let me show you a simple comparison that I made. The mid drive has more pros than cons at least for me so that is why I decided to go for it. The next step was to pick a specific make and model. I browsed the Internet for a few days until I found Bafang’s mid drive kit series. It seems that a lot of people a choosing them which means they are proven to be good enough. The last thing left to choose was the motor power. According to EU (and Norway) current laws an electric bicycle is considered a bicycle if it always requires pedaling in order to provide assist, the top speed is limited to 25km/h and the power is limited to 250W. There is a reason for such brutal limitations and it is all the crazy people building dangerous bikes and driving them like crazy. Also imagine a kid driving it’s 5kW electric bicycle on the sidewalk with 50km/h. Not good, right? Unfortunately such limitations are a problem in some cases. For example a cargo bicycle (post service or food delivery) which needs more power to operate properly. Or in my case climbing very steep hills with additional load. The next issue with the law is the throttle which allows you to move without pedaling. This isn’t needed often but is still useful. For example leveled road with short but steep uphill parts. I don’t need assist on the leveled parts but uphill sometimes requires it. I’d like to use the throttle in those parts of the road. Why? Because while using pedal assist the motor is running all the time if you pedal. Even if you reach the speed limit the motor does not stop. It just reduces the current. This way it will smoothly start to help you again when your speed drops down. On a long leveled road with just a few short uphill parts you will lose a lot of power for keeping the motor spinning. So what did I choose? I chose Bafang BBS02, 750W motor at 48V. It isn’t legal bicycle but as long as I don’t do speeding, anything crazy or dangerous everything will be just fine. 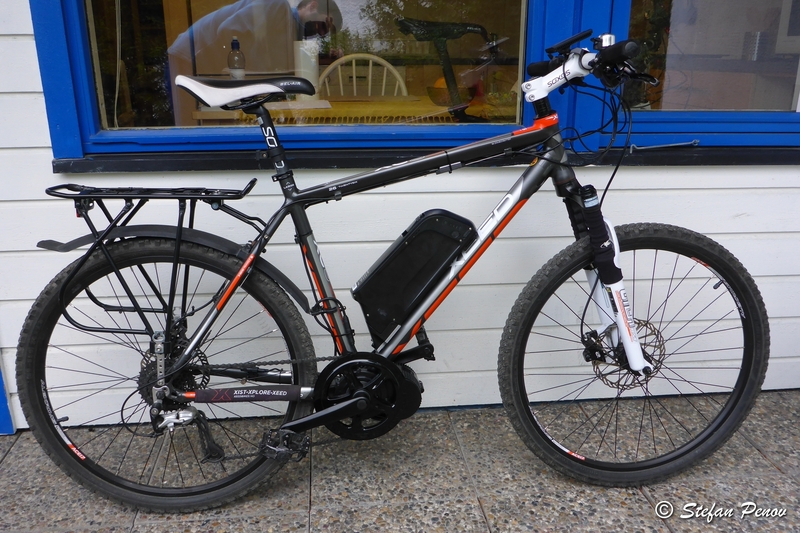 I have tried a front drive 250W e-bike on a steep uphill and the motor was in pain if I wasn’t pedaling well so now I bought motor with more power. 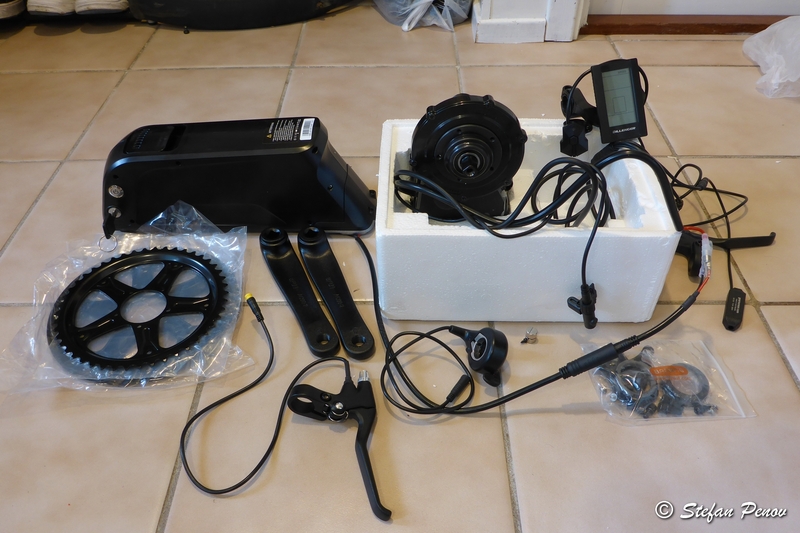 This way I will not overload it and will always have enough power for even the steepest rideable hills. I bought my kit from Dillenger UK. I am really happy with my choice. Those guys responded very fast to all my questions and I had no issues at all with my purchase. Looking at the photo above you can see what the kit I bought includes. Shopping from abroad might add up to the price for some of you so if you decide on that, make sure you know the consequences. In my case UK is in EU and Norway isn’t which means that I will pay VAT on everything more expensive that I import. VAT is 25% in Norway. Dillenger helped with that but I won’t get in details about it. In addition to the kit I also needed some special tools. I had some of them and others I had to buy. If you don’t do everything on your bicycle at home, then you will probably need to buy some tools for the installation of such kit. Other brands will probably require different tools. Sometimes the dealers offer sets of all tools needed which will save you time looking for them, but might be a bit more expensive. For Bafang’s BBS02 kit you need crank extractor, bottom bracket specific wrench to remove your old bottom bracket and install the new motor there, lock nut wrench, Philips screwdriver and hex wrenches. Another thing you will need is a chain tool if your chain doesn’t have “quick link”. You will not need your front derailleur and if you want to remove it to save weight, you need to cut the chain. As you can see in the photo below, I used a lot more tools but more for that later. Stay tuned for the next post when I will show some more photos and explain about the conversion process. It wasn’t as easy as I thought it will be. Posted on 01.11.2015 04.09.2018 by PenoffPosted in E-Bike ConversionTagged Bafang, battery, BBS02, bicycle, bike, BLDC, e-bike, e-brake, ebike, lithium, mid drive.